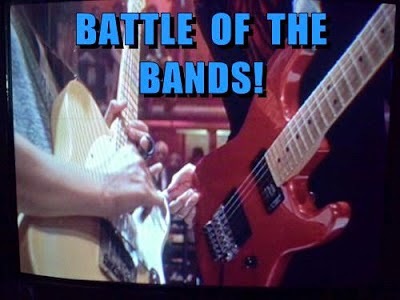 In this round my Battle of the Bands was between two different songs with both videos shot in Los Angeles. There wasn't much of a contest between the two opponents. I thought that the Postino video might have won some votes with it's clever sense of humor. That what happened for me. At first I had an adverse reaction to the music though I'll admit it started to grow on me to where I like it now. I especially liked the video which I found to be unique, quirky, and funny though it took a couple views for me to start catching all of it. As far as my video vote (which I guess most voters missed) I gave my vote to Postino as did a couple of you. Like the majority of the voters my music/song vote went to Jenny and the Mexicats for best song performance. I really like this group so it's always possible that you might see another future Battle featuring this group. Another year come upon us. I can only shake my head in pondering the fact. This holiday season I'll be doing something on this blog that I've never completely done in the past--I'll be taking a break. Oh, I might get on the internet now and then and maybe drop in on a blog or two, but I'm finding that a lot of bloggers are already on break. Seems like a good time for me to do it too. My return will be with the January 15th version of Battle of the Bands. Now I'll need to decide which Battle I'll be using. Happy Christmas Lee to you and family and thanks for your support through the past several years plus that wonderful day in LA. Had the winner this month on BOTB. Yvonne, you've been among my longest supporters and I appreciate that. Hope you have some great things happen in 2018. Now that was a blowout. Have a blessed Christmas, Lee! Alex, my whole life has been blessed so I hope God continues to work in my life. Merry Christmas & Happy New Year to you, Arlee and family. May 2018 be a joyful year for all. Juneta, we all need some uplifting in the year to come. I did not care for the Postino video because I found it too contrived, too affected. To me, it's just not "cute" when adults try to use kids and "create" something that's their idea of "adorable". It always comes off to me as hokey and, actually, kind of annoying. However, there was (as I stated in my vote comment) actually some interesting guitar and keyboard music behind that Postino video, and I would have been interested in hearing just the music without the distraction of a kid trying to "act" cute and the constant repeating of the words "I love it". There's maybe some real musical potential buried in that video. Hey, a Merry Christmas and a Happy, Healthy, and Blessed 2018 to you and yours!! STMcC, I'm thinking that maybe John gave me a kind of mercy save when he saw how badly things were going. I'd say the Postino video was meant to be contrived and artificial to contrast with the sometimes gritty background. But then I think I have a greater tolerance for weird and poppy things. Again it's that old matter of tastes. I think we all deserve some really great things in the year ahead--especially Trump supporters. I was too late on my vote, but it looks like you had a runaway winner. I wish you a wonderful Holiday season! Mike, your vote wouldn't have changed much I'm sure. This match was destined to end up with a runaway. Have an excellent Holy Christmas, Lee! Sing with those grandkids! Susan, I am so looking forward to grandkids and everyone else! CW, yeah, not all that much good reason to feel bad. Not about this BOTB match. Hilary, I've raised my glass in returns of optimism. I have had some battles to tip the scales this heavy in past months but I'm always surprised nonetheless of the outcome. Hooray for you for scheduling a blog break. I won't be around next week even though I have advanced posts set. Have an enjoyable holiday season and I'll see ya around the cyberblock, my friend! Cathy, it's nice to have a better balance in voting, but I can see why it happened here. Enjoy your Christmas and New Year! Carrie-Anne, Thank you and hope next year is a good one for you. Happy Holidays, Arlee. Hope you are enjoying your time with family and your grandkids. Sorry that I don't the Battle of the Bands. Natalie, thanks for stopping by. A bit late to wish you a Merry Christmas, but I hope you have an awesome New Year! Loni, aside from difficulties accessing my online activities, this vacation has been wonderful and indeed awesome. I hope you have a a good break and a wonderful New Year! I look forward to collaborating in 2018. J, my computer is extremely slow and thus I have had problems communicating with you. I get back home in about a week and a half. Be with you then. Eagerly awaiting your return, my man! Hope all is well. Cathy, thanks so much. I've been limited in my online activities so I've not been able to comment on your posts, but it's been a wonderful holiday break so far. Hope you are having an excellent break. Happy New Year 2018! Nilanjana, thank you so much! I wish you the same for the new year.